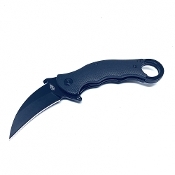 Black G-10 handles with finger ring and tip-up carry pocket clip. Closed length 5". Black finish D2 tool steel hawkbill blade. Silky smooth flipper action. Weight 5.9 OZ. Sweet tactical with a lifetime warranty.